Research, prevention programs, and open discussion are required to reduce nurse suicide. Suicide is a challenging concern for healthcare professionals. The lack of data related to suicide among nurses is a barrier to prevention. Suicide is not openly talked about in nursing, but the more we talk about it the more lives we can save. Depression is a treatable illness. If you or someone you know needs help, contact the National Suicide Prevention Lifeline at 1-800-273-TALK (8255). When celebrities die by suicide, discussion of this stigmatized topic makes its way into the headlines and conversations at work and home. That was true this year when Kate Spade and Anthony Bourdain died by suicide. These shocking deaths of two people who appeared to have it all once again brought our attention to this serious public health issue. We must remember, though, that no group—occupation, race, gender, socioeconomic status—is immune to suicide. (See Troubling numbers.) That includes nurses, who work in a profession that’s strenuous and stressful and requires a high level of compassion and empathy. Unfortunately, nurse suicide has been a hidden phenomenon and hasn’t been adequately studied in the United States. The loss of a nurse coworker to suicide is more common than we realize because it’s frequently concealed by the family and organization. However, when we talk about suicide—its causes, who’s at risk, and how we can help to prevent it—we can save lives. A 1990 report on occupational suicide risk in the United States showed that when adjusted for gender, the odds ratio for a nurse dying by suicide was 1.58 times greater than the general population. Although more recent data for this country isn’t readily available, we can turn to others who have been studying nurse suicide on an ongoing basis. In 2017, the United Kingdom released a report from its Office for National Statistics that reviewed 18,998 suicides between 2011 and 2015 in England and Wales among people age 20 to 64. The report revealed that suicide among female nurses was 23% higher than the average for women in general and the highest among female professionals. The study also showed that most suicides among nurses were by poisoning, which may be linked to their knowledge of and access to drugs. It’s worth noting, however, that identifying occupational risk for suicide is difficult, given the complexity of the relationship. A general internet search produced no public data identifying a national nurse suicide rate in the United States, yet data on suicide rates are readily available for physicians, teachers, police officers, firefighters, and military personnel. The Centers for Disease Control and Prevention (CDC) maintains a restricted National Violent Death Reporting System (NVDRS), which is the most comprehensive death registry by suicide coded by occupation. It has been growing yearly, with data available for 40 states, the District of Columbia, and Puerto Rico. The dataset has not been queried for nurse suicide statistics. To address nurse suicide, we must do more, starting with increasing our knowledge and awareness of suicide within the profession, including the cost to society, risk factors, prevention, and barriers to care. (See What’s the cost?) In addition, we need to provide support at all levels with proactive education and risk screening tools (other professions, including physicians, have developed protocols and toolkits specific to their workforce). Individuals, policy makers, professional organizations, and healthcare system leaders (specifically nurse executives and educators) are potential stakeholders for promoting awareness of nurse suicide and implementing programs designed to prevent it. A better understanding of health determinants and their interactions and impact is key to improving and maintaining mental health. Individual and institutional attention to nursing stressors (workload, long hours, lateral violence, bullying, staffing, lack of resources, and dissatisfied patients) may enhance employee engagement and nurse well-being. With no data to determine the suicide rate for nurses in the United States, risk factors for nurse suicide haven’t received the attention they deserve. What we do know is that the contributing factors related to nurse suicide are numerous and alarming. Key risk factors for nurse suicide— mood disorders, past attempts, access to means, substance abuse, and past or current mental illness—are similar to those for the general population. A review by Davidson and colleagues found that collective risk factors leading to nurse suicide include depression, knowledge of how to use a lethal dose of medication and toxic substances, personal and work-related stress, smoking, substance abuse, and undertreatment of depression. A recent quality improvement program at the University of California in San Diego found that workplace stressors present in nurses at high risk for suicide include feelings of inadequacy, lack of preparation for the role, lateral violence, and transferring to a new work environment. Understanding the determinants of mental health, which include race, ethnicity, gender, age, income level, education level, sexual orientation, and geographic location, also is important. In addition, social conditions—interpersonal issues, family and community dynamics, housing quality, social support, employment opportunities, and work and school conditions—can positively or negatively influence mental health risk and outcomes. Preventing suicide must include two goals: reducing factors that raise the risk of suicide and increasing the factors that protect people from it; often the two overlap. Organizations, nursing leaders, and staff all play a role in prevention, starting with fostering protective factors. In general, protective factors include access to effective behavioral healthcare; connection to friends, family, and community; good problem-solving and coping skills; and having a sense of purpose. Healthcare organizations can provide additional protection within the workplace by emphasizing teamwork, promoting a culture of safety and wellness (including mental health), providing access to insurance and mental healthcare, establishing support systems, and training nurse leaders and managers. The American Nurses Association (ANA) and the American Organization of Nurse Executives both recognize the stress in the profession and have called for action to optimize a healthy work environment. And a study on workplace wellness by Baggett and colleagues reported that nurses feel cared for when leaders see them as whole people, recognizing problems they might be having at home as well as at work. Access these resources for help in identifying risk factors and warning signs of suicide and depression and to find out how you can implement suicide prevention programs and activities in your organization and community. Review the lists at these two sites to learn how to identify a coworker who’s at risk for suicide. Individual nurses and organizations can start creating a more positive work environment by tapping into existing resources. The American Association of Critical-Care Nurses has identified six Healthy Work Environment (HWE) standards—skilled communication, true collaboration, effective decision- making, appropriate staffing, meaningful recognition, and authentic leadership. Nurses can complete the HWE Assessment Tool (bit.ly/2p64SGU) and work as a team to address identified problems. Nurses and organizations may also want to participate in ANA’s Healthy Nurse, Healthy Nation Challenge™, which encourages nurses to take action to improve both mental and physical health (bit.ly/2x41BMH). In addition, a healthy work environment does not tolerate bullying, which can harm a nurse’s mental health. Suicide prevention must include strategies that promote mental health and involve both individuals and institutions (communities, workplaces, schools, healthcare organizations). Prevention starts with research at the state, regional, and national levels. 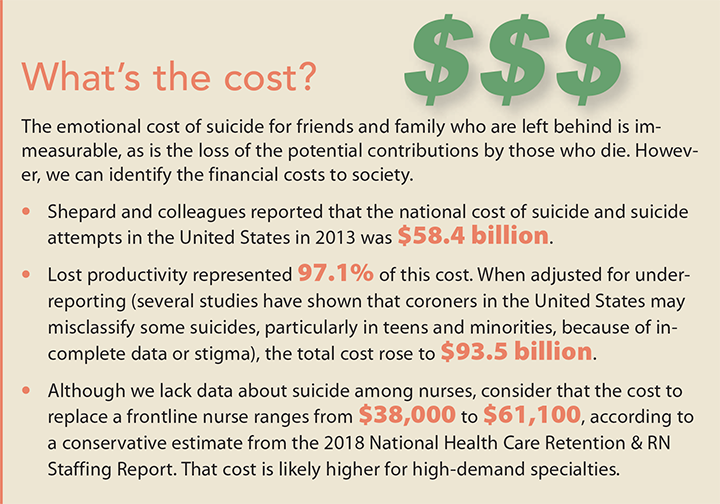 The more we know about suicide among nurses, the better we can advocate for funding to create and disseminate education and prevention programs to healthcare organizations across the country. The first step is developing a standard method for collecting data on suicide among nurses across all healthcare settings. If you know the warning signs that indicate a coworker may be in immediate danger of suicide, you can take steps to help. The National Suicide Prevention Lifeline provides a list of suicide risk factors and warning signs (suicidepreventionlifeline.org/how-we-can-all-prevent-suicide). Here are a few of the red flags that should prompt you to act. Additional red flags are available at bit.ly/2MG04RR. Have you ever thought about suicide before or tried to harm yourself before? Do you have access to weapons or things you can use to harm yourself? Note: Asking about suicide intention will not prompt the person to take action, as some erroneously believe. Extensive research, including a 2014 literature review, shows that asking if someone if thinking about suicide doesn’t increase the risk and may, in fact, decrease it. All healthcare organizations should publicly display contact information for the National Suicide Prevention Lifeline (1-800-273-8255). The lifeline provides free 24/7 confidential support to anyone in suicide crisis or emotional distress. Mental health care still carries a stigma. This is particularly true among nurses, many of whom feel that they should carry their burdens alone. Creating an information campaign, speaking openly about suicide and depression, and providing access to mental health resources can help alleviate some of this stigma and normalize requests for assistance. Community activities also can help to reduce stigma. For example, Out of the Darkness Community Walks (bit.ly/2N4OkfZ) not only raise money for AFSP but also draw attention to the issue of suicide. Before many suicide prevention efforts can be put into action, funding must be secured. Financial resources allocated to prevent suicide are dispersed from various sources, such as the Substance Abuse and Mental Health Services Administration, which, as of September 2017, has awarded $14.5 million in grant money for suicide prevention programs. Federal and state laws play a big role in suicide prevention activities. For example, state laws can provide resources for prevention, open doors to collaboration, encourage training, and help increase awareness and knowledge. They also regulate training, policies, data collection, and suicide prevention programs. Federal laws typically target funding initiatives. Currently, no policies specific to preventing suicide among nurses exist. Data collection is particularly important because it’s not always collected consistently. Currently, suicide data are most commonly stratified by gender and age. 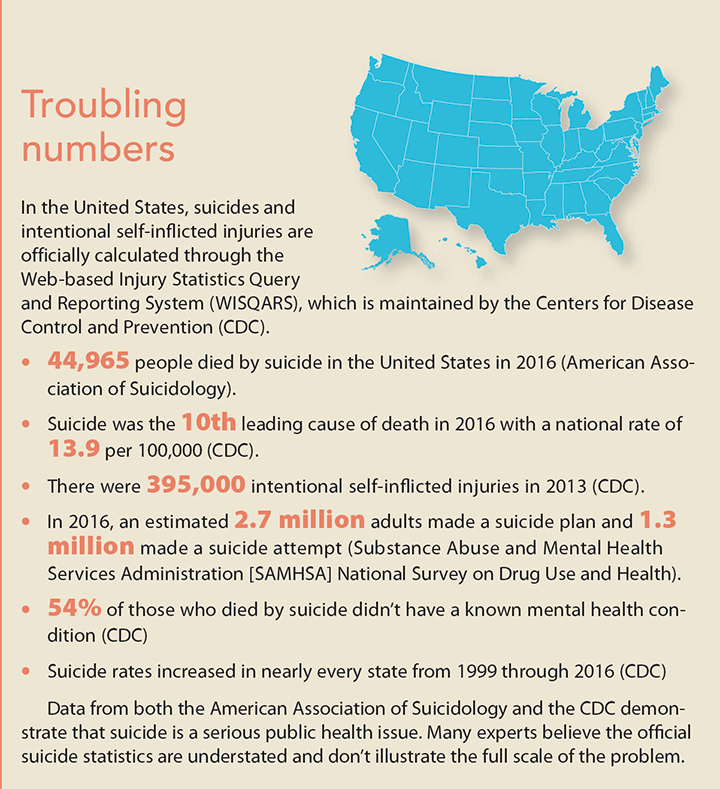 Suicide also can be stratified by means (how the person died), geographic region (which can be stratified from a national level down to the county level), race, and certain occupations. Editor’s note: This is an excerpt from a story titled “Depression and substance abuse: The danger of being strong for far too long.” To read the full story, visit americannursetoday.com/blog/the-danger-of-being-strong-far-too-long. The reason is that I have personal examples of the stigma that affects nurses when anything having to do with mental health arises. During my health screening before working in the emergency department (ED), I was asked to list my medications. This was my first position as a nurse, and since they asked, I was honest, and listed Prozac, an antidepressant that I had been on since I was 18. The nurse practitioner reviewed my chart and said, “Maybe you should think about another department. I see that you are taking Prozac. The ED can be very stressful and demanding.” This was a defining moment in my career. I was expected to educate patients along with their family members that it was acceptable to take medications for mental health issues such as depression. Your life was not over. You are not defined by this disease. I had falsely assumed that because society was being educated, and the stigma that comes along with seeking and adhering to treatment for depression was decreasing, that I was in a safe place to disclose this as a nurse. I never felt so insecure, ashamed, and idiotic for thinking that nurses would be treated with the same grace as how we treat the public. Nurses struggling with addiction may be reluctant to seek help. Go online to americannursetoday.com/blog/my-journey-to-addiction-and-back/ to access one nurse’s story. A national standard for preventing suicide among nurses must commence with the same urgency deployed to address physician suicide. You can take action in your own organization. Get involved on committees that work to create a culture of wellness. Find out if your organization distributes mental health awareness materials (brochures, posters, fact sheets). If it doesn’t, ask how you can help make this happen. Does your organization offer suicide prevention skills training and workplace mental health screenings? Suggest partnering with your Employee Assistance Program (EAP) to explore proactive prevention strategies. 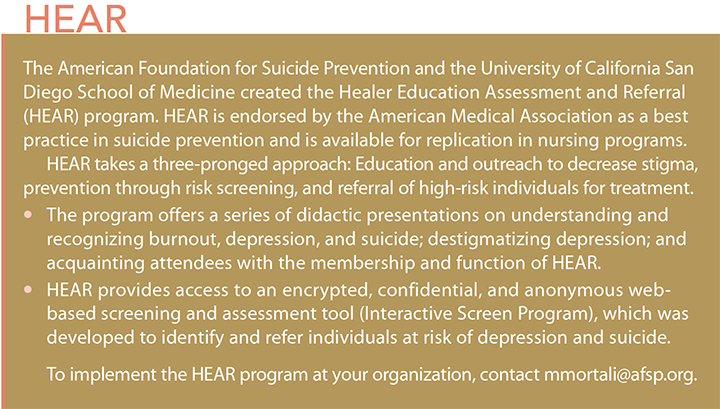 Advocate for the implementation of a suicide prevention program, such as HEAR. Suicide prevention is a team effort that should include nurse leaders, staff nurses, human resources personnel, EAP members, and financial officers. Preventing nurse suicide requires identifying, organizing, inspiring, and facilitating the successful implementation of research, policies, and programs that help nurses at risk or in crisis. Leah Heather Rizzo is associate vice president for nursing services at Geisinger Northeast in Wilkes-Barre, Pennsylvania, and she’s a doctor of nursing practice student at Carlow University in Pittsburgh, Pennsylvania. How dirty is your cellphone? I’m six months out of nursing school and falling orientation at a top hospital in Maryland. It’s tough realizing that one simply isn’t good enough to handle floor nursing. Some people can’t handle it, my life is pointless without nursing. I’m 40, no kids, no friends, never had a girlfriend longer than a few weeks. Some simply aren’t meant for this world, at least I’m I won’t be in danger of hurting patients. That’s all that is important. I’m sending this letter because this article addresses a contemporary nursing issue, that elicits a professional response in me. This article immediately drew me in. I hope to be able to add to this discussion from some of my experience as a nurse, and as a staff member of a Behavioral Health Unit. I appreciate the information in the article and find some of the numbers astounding. The author really hit the nail on the head by stating that no one is “immune” to suicide. I started working as a Psych nurse almost three years ago and it never ceases to amaze me how many people you would never expect to see suffering from mental illness, mostly depressed or suicidal, walk through our doors. I agree that we need to increase our knowledge of suicide in the profession. When working in the hospital setting, new employees are expected to sit through countless hours of education about how to use the information systems, policies and procedures, dress code, salary and retirement plans but what about how to better care for our own well-being? In a profession where we are constantly giving of ourselves to others, we so often neglect to think about our own health. I would like to see organizations implement “employee wellness” classes as part of new employee orientation and offer information on mental health and how to get help. This article had a very informative section that identified “red flags” and how to take action when you see them. This is the kind of information educators, leaders, management and staff should have access to. Hang it on the walls of the bathroom, in the nurse’s station, in the copy room, in mailboxes, and get people talking about it more. Healthcare workers in crisis should feel safe to talk about their mental health with management or co-workers so they can get the help they need. If organizations can foster that safe environment from day one of employment, I envision they would not only feel cared about, but the door would already be open to those sometimes-uncomfortable conversations. The subject of suicide just isn’t talked about enough in our profession I hope that in the future, there will be more research and education in our hospitals and other healthcare facilities that will promote positive work environments. If we can open the lines of communication and educate ourselves and others, it is my hope that we can one day break the stigma of Suicide. I would like to thank Leah Heather Rizzo for bringing this topic to the forefront. I have also suspected that nurse suicide is underreported, unrecorded and much more common than we would like to believe. I also have tried to find nurse suicide statistics and queried government datasets and death records in Canada while I was a graduate student to no avail. Nurses face unprecedented violence at work, increasing workload, bullying and unmeasurable stress to care for others, all the while depleting their own stores of self-preservation and self-care. How could nurses not have an increased incidence of suicide and mental health issues? Articles like this will help decrease stigma and open the door to conversations that are long overdue. In the meantime, nurses in the USA and Canada need to gather their statistics on nurse suicide in order to lobby for work place mental health recognition, improve access to resources, and help our fellow nurses who suffer in silent hopelessness. The October 2018 CNE article “Suicide among nurses: What we don’t know might hurt us” is timely and illuminates a tragic occurrence found in the nursing profession. While the actual number of suicides committed by nurses in the United States is conflicted and outdated (Davidson, Stuck, Zisook, & Proudfoot, 2018), the data reveals that in 2016 suicide was the 10th leading cause of death for people aged 10 and older (Centers for Disease Control and Prevention, 2018). Just recently our hospital lost a talented and caring young nurse. She, for reasons unknown, chose to take her own life. Devasted co-workers racked their minds trying to piece together what clues might have been available, and what actions could have been taken to prevent the loss of a beautiful human being. Very often, it’s the one who provides a healing touch, who desperately needs the very same help. This article highlights a variety of factors which can lead to suicide and offers prevention strategies. There are interpersonal factors, along with workplace stressors such as burnout, and feelings of job detachment, which can be addressed by the nursing profession (Davidson et al, 2018). We need to be proactive to provide a workplace which is conducive to a supportive and affirming environment not just for the work at hand, but for those who do it. Taking action to develop and promote a national standard for the prevention of nurse suicides is a must, and the workplace is a good place to start.